A badly injured Bold shelters in a bush, where he meets Crow again. 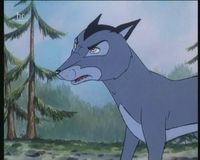 After finding out that Bold is the son of the legendary Farthing Fox, Crow takes pity on him and goes to find Shadow the badger. 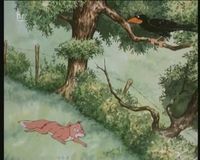 In White Deer Park, the foxes prepare for the fact that Scarface will be out for revenge, if he suspects that Bounder’s death was anything to do with them. They organise patrols to keep watch, and Charmer eagerly volunteers to go first. The Weasels, realising they are in trouble, spend all day hiding from Whistler, who is out looking for them. 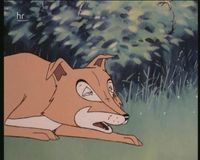 In Scarface’s den, Scarface vows to get revenge on the Farthing foxes, while Ranger tries to persuade him that it is the snake that killed Bounder, that they should be looking for. Scarface laughs at Ranger’s suggestion that they should make peace with the Farthing Foxes. Adder is laying low by the pond, and starving herself to save venom. She is after Scarface now. While Charmer is on patrol, she once again meets Ranger; but they are caught by Friendly. It looks as if the two male foxes are going to fight, but Charmer persuades Ranger to leave. So this is how you guard your family! says Friendly to his sister. Wait till father hears about this . On the way back to his own land, Ranger spots Adder asleep by the pond, and rushes home to tell his father. Scarface catches Adder unawares. She dives into a hole in the bank, but Scarface grabs her tail. After a tussle, Adder ends up losing the end of her tail in Scarface’s mouth, but atleast she is safe in the hole. Scarface vows to wait until she gives herself up. Shadow brings Bold some food. Crow has told her who Bold’s father is. Bold realises he will never get away from his famous father. After a sleep, Bold feels a bit stronger. 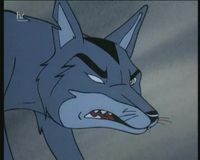 He tells Crow he hates being dependant on him and Shadow, and is determined to fend for himself. Bold arrives at a farm and tries to attack the chicken coop, with no success. The farmer and his dog chase after Bold, but he manages to escape into a hole. That evening Crow finds him, and suggests Bold try the town, where he can scavenge. Bold sets off towards the town.